Set of 65 tokens. 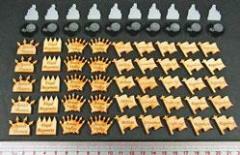 The Age of Muskets token sets is a great addition to your musket era miniatures wargames. The set includes a variety of useful tokens for unit identification, shooting, and loosed volleys of spears and arrows by those pesky natives.